Invisalign® is an invisible orthodontic treatment that strengthens the teeth using removable aligners that are almost invisible and made to measure for your teeth for greater comfort. The aligners are altered every two weeks to allow the teeth to gradually move over the weeks until they reach their final position. Invisalign is a comfortable, transparent and removable system meaning you can transform your smile without it affecting your daily life. Over 3 million people worldwide have already discovered it. When is orthodontic treatment with Invisalign recommended? Invisalign® can be used to treat a wide range of problems related to teeth straightening, from small teeth movements to more complex cases. Whatever the problem, the result is a new, more even smile that you will want to show the whole world. Barcelona Dental Studio is a dental clinic in Barcelona with experts in invisible Invisalign orthodontics. Our facilities, personalised service and approachable manner means you are sure to have a very pleasant treatment experience. We also work with the latest in invisible orthodontics technology. Whatever you hope to achieve with your treatment, Barcelona Dental Studio will always offer you a clear and easy to understand treatment plan. We will also show you how your teeth will look during and after treatment and, thanks to our computer simulation ClinCheck, you will be able to visualise our treatment plan using 3D virtual technology. ClinCheck shows how the teeth are expected to move during the treatment. This allows us to predict how your teeth will look at the end of the treatment and control the changes as they happen. Book your appointment and we will evaluate your treatment and the dental technology that would best suit you. We will give you an estimate with a fixed price and no obligation to buy. Invisalign is the most comfortable way to get a perfect smile. When deciding on the best invisible orthodontics to straighten your teeth, there is only one possible option: Invisalign. The Invisalign esthetic orthodontic system can be used to straighten teeth in almost all cases of dental malocclusion. Apart from severe malocclusion that involves significant movement to the dental root, the orthodontist can use Invisalign to correct and straighten teeth for patients who want a better smile without braces. Invisalign is a treatment both for young people and adults. The length of the treatment with Invisalign may vary depending on how severe the malocclusion is, but in both types of patients it is possible to get good results with this system of clear orthodontics. Nowadays, in Barcelona Invisalign is the most attractive orthodontic option and the most effective for teeth straightening. Before deciding on a treatment plan, at Barcelona Dental Studio we take a mould of your teeth and use this to create a detailed treatment plan with a simulation system called ClinCheck®. This shows how your teeth are expected to move during the treatment and means we can see the final result even before treatment begins. 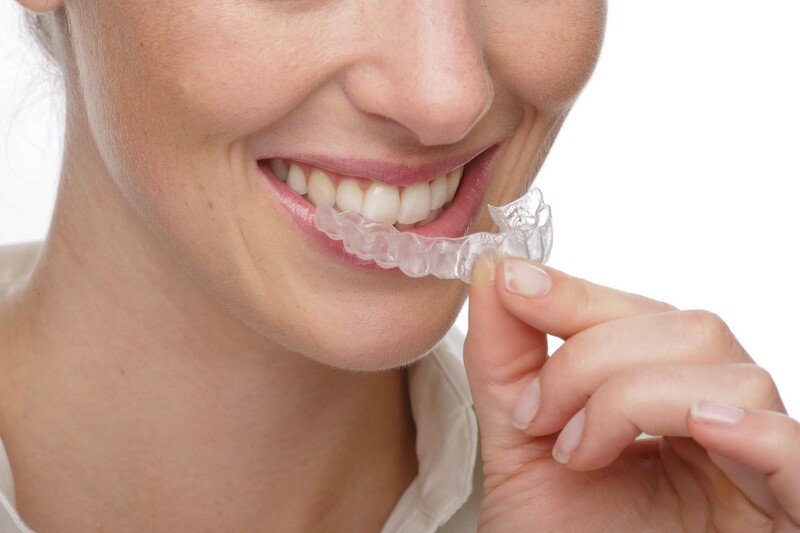 When the Invisalign treatment begins we will provide you with a set of made-to-measure aligners. As the aligners are altered, the teeth gradually move until they reach their final position. During this time, you will have occasional appointments to monitor progress and to make sure you are comfortable with the treatment. The length of the treatment will depend on the patient and the complexity of the problem. At Barcelona Dental Studio we will tell you which Invisalign method would be suitable for your situation and give the result you want, to make sure you get the best treatment option for you. To see how you could get the smile you have always wanted with Invisalign, book an appointment for a free consultation with no obligation to buy with our specialists in invisible orthodontics at Barcelona Dental Studio. Invisalign is almost invisible. Using clear aligners means that even if you are standing in front of a person with Invisalign, it is impossible to tell. The treatment is very comfortable; the patient does not have any wire or metal in their mouth. The treatment is completely harmless and does not cause any irritation to the mouth or gums. Because the clear aligners are removable, the patient can eat and drink normally. Dental hygiene and every day cleaning of the mouth can be done as normal and means that patients who use Invisalign can keep their mouths particularly clean because they can even use dental floss. Because Invisalign is a system of removable, clear aligners that are not fixed to the teeth like traditional systems, it works perfectly even in patients with porcelain crowns and/or porcelain dental bridges where it is difficult to attach traditional braces correctly. More than a million and a half patients have been treated with this system of Invisalign invisible orthodontics, a fact that more than demonstrates that it is a reliable and effective system. It is important to point out that to achieve the desired results and enjoy all the advantages offered by the Invisalign system of invisible orthodontics, the patient must use excellent dental hygiene as well as using the clear aligners for a minimum of between 20 and 22 hours a day. The Invisalign invisible orthodontics system are aligners that can be taken out and put in the mouth. In contrast to fixed metal braces, patients can live their life as normal and eat and drink as they want during the treatment, simply by removing the aligners. Patients can also take out their aligners to clean their teeth and use dental floss as they would normally to maintain good dental hygiene. In contrast to traditional, fixed braces, there are no metal attachments or wires. This means that in the majority of cases patients spend less time at the dentist having adjustments made during the treatment. Invisible orthodontics for adults, when is it necessary? Invisalign can be used to treat malocclusion in many cases where adults want to correct their smile. – Teeth crowding because there is not enough space in the jaw for all the teeth to grow normally. – Excessive spaces between the teeth because there is too much space in the jaw. – A crossbite that happens when the upper and lower jaw are not correctly aligned. Usually this means that there are one or two upper teeth that bite inside the bottom back teeth and this can happen both at the front of the mouth or at the side. – An overbite happens when the upper teeth overlap significantly on the lower teeth. – Protrusion occurs when the lower teeth extend beyond the upper front teeth. This is normally caused by insufficient development of the upper jaw, an overdeveloped lower jaw or both. Invisible orthodontics for teenagers, when it is necessary? Depending on how developed the teeth are, Invisalign offers several treatment options for teenagers. Some teenagers may be able to use the same Invisalign treatment as adult patients. Younger teenagers or those whose teeth are still erupting can be treated with Invisalign Teen, a treatment specially developed for teenagers. Our specialist in invisible orthodontics will decide which treatment is best for each individual case, depending on the state of the teeth. The main advantage of Invisalign is that it is a more attractive and flexible way to give teenagers the confidence that a good smile brings. Invisalign aligners are also removable, meaning that teenagers can brush their teeth and use dental floss as normal. This can help create better dental hygiene habits for the future.